The fun began on July 27, 1999 when U.S. Beanie Card Collectors began to discover Series III of the Beanie Babies Official Club Collector's Cards at retail. Sporting a brand new look in a colorful teal swirl featuring photos of Millennium, Jabber, Cheeks and Schweetheart, Series III includes 157 individual Beanies Collector's Cards which is a greater number than in any previous series. Collectors appear to be very excited about the new look of these cards. There are many different types of chase cards in Series III. There are Autographed cards, Retired cards, Classic Common cards, Beanies & Buddies cards, Birthday cards and Wild Cards. Like the previous series, there are four different color variations of the Retired, Beanies and Buddies, Birthday and Wild Cards. The colors are turquoise (most common), magenta, silver and gold (least common). On the retired cards, the color is determined by the background color of the card. On the Beanies & Buddies and Birthday cards, the color is determined by the color of the name of the Beanie or Buddy. On the Wild Cards, the color is determined by the color of the stars that surround the Beanie. There are 8 cards plus a Beanie Sticker card in every pack. One of the 8 cards included in a pack is an Artist's Proof card. The suggested retail price of a pack of Series III cards is $2. It is believed that since Ty Warner signed one of every card from Series I and II, that he has done the same in Series III. All autographed cards are numbered 1/1 and are signed "ty" with a gold paint pen. There is also a small clear TY heart embossed on top of the signature. The Retired card is die-cut and different than any BBOC card I've seen to date. See photo on the left. (Nancy from Rascalz's Beanie News and Rumors) Retired cards bear a limited edition numbering on the back of the cards. Classic Common cards look just like the common cards found in Series I and II but are stamped "Classic Common." Birthday cards are metallic and have the name of the Beanie Baby printed vertically going down the left side of the card. The birthday of the Beanie appears in a gold star in the middle of a red banner that says "BIRTH DATE." "Wild cards are reflective, foil-type card, with the Beanie centered and surrounded by a ring of stars," explains Sharon. "On the back of each of these is a "Wild Fact" relating to something about that animal in the wild." Gold cards have a limited edition numbering on the back of the card. There are only 100 gold cards made of each of these wild cards. Artist's Proof cards are NOT all-foil cards. They are exactly like the common cards, with the addition of a small foil stamp that says "Artist's Proof" surrounding a Ty heart on the front right side of the card. On Common Cards, the name of the Beanie is in big (1/3 to 1/2 size of the card) outlined letter. The Beanie is posed against different backgrounds, such as a farm, underwater, polar region, etc. depending on the Beanie. Some Beanies are raised and smoothie like Series I, others are textured like Series II. 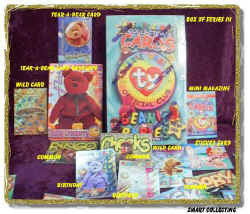 The words "Beanie Babies" in color appear on the lower left corner, the style number appears in a footprint, shell, heart, or horseshoe in the lower right corner of the card. On the back of the card, the poem, birthday, issue date, and a fun fact which may or may not be related to the Beanie is printed. Three peel-off stickers on a theme background (underwater, jungle, farm, pond, etc.). Many of the older Beanies are the same photo as the one used for the Club Kit I stickers, though some are mirror images. All are slightly smaller than the Club Kit stickers. Inside a case of Series III cards is a cardboard insert holding a four screw card holder with a semi-transparent card mounted inside of it. Each has a picture of a group of Beanies on both sides. One card has a message that says, "ISSUED: 6.3.95." This message is repeated over and over again on a clear background. The other card has a clear pink background that says, "ISSUED ON 6-25-94." The following Beanies are pictured on the front of this card: Teddy the old-face Teal bear , Teddy the old-face Cranberry bear, Teddy the old-face Violet bear, Blackie the black bear, Mystic the unicorn, Inky the tan octopus, Happy the gray hippo, Speedy the turtle, Bones the dog, Peking the panda and Web the spider. On the back of the cards are pictures of different Beanies. Inside a sealed box of Series III cards, is a card that is approximately 4" X 6" that says LIMITED EDITION TEAR-A-BEAR CARD. When you tear off the top, there is a special limited edition bear card inside. There is no number on the card just a picture and a poem.